Confusing your WWE with your WWF?! We explain what it's all about! You what - World Wrestling Federation or World Wrestling Entertainment?! Firstly, we think that we should explain why some people call it either the WWF or the WWE. The cut a long story short, it was originally called the WWF (World Wrestling Federation) but it was later changed to WWE (World Wrestling Entertainment). The reason for this is because of a lawsuit which began in 2000 from another group called WWF which was the World Wildlife Fund. Instead of risking getting fined for a lot of money, McMahon who was in charge of the WWF at the time just decided to change the name of the federation. Anyway, there are literally millions of people all around the globe that have been watching WWE as it’s now called on the television on a weekly or even a daily basis since they were a child. However, not a lot of people realise that WWE has been in existence since the mid 1920s, so it’s not exactly new. Back then, a man named Roderick McMahon was a promoter for boxing fights and he got in contact with some professional wrestlers. After he got in touch with a few professional wrestlers, he decided to come up with some new moves and ever since then wrestling has become increasingly popular. 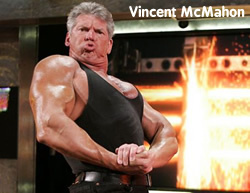 Most wrestling fans will probably know Vincent McMahon who is Roderick’s son. A few decades later, Roderick McMahon teamed up with someone else and made an organization known as CWC which is what we now know as WWE. At this point, Vincent took over most of the control of the organization since his father was beginning to get old. Only a couple of years after Vincent McMahon took over control, he had wrestling matches on television which was one of the best ideas that he has ever come up with and probably the best idea that he’ll ever have in his entire lifetime! Not long after this, there were a few disagreements since Vincent McMahon and Mondt who also owned some of the WWE at the time didn’t want to host wrestling events in certain parts of the US. Because of this, they decided to join forces without the need of any other organizations, and they set up the WWF. Mondt later retired and ever since then the McMahon family has owned the WWE and have done a great job running it for so long. The WWE has been a household name for years now and it’ll more than likely keep its popularity for a long time to come. Even though it’s mainly targeted at Americans, the WWE is the most popular wrestling organization in Europe as well as plenty of other places around the world. At the moment, in the UK you can watch WWE on several Sky Sports stations and there is coverage every couple of days so you’ll never miss anything got to do with WWE! There are several PPV (Pay Per View) events such as WrestleMania that you can watch on Sky Sports, but there are also plenty of matches that you can watch without paying to view (although you’ll need Sky Sports to watch it).